فخری, منصور, شهنی‌ دزفولیان, رضا. (1397). تعیین عدد سازه‌ای موثر روسازی بر اساس شاخص ناهمواری و خرابی سطحی با استفاده از مدل‌های رگرسیون و شبکه عصبی. پژوهشنامه حمل و نقل, 15(4), 207-221. منصور فخری; رضا شهنی‌ دزفولیان. "تعیین عدد سازه‌ای موثر روسازی بر اساس شاخص ناهمواری و خرابی سطحی با استفاده از مدل‌های رگرسیون و شبکه عصبی". پژوهشنامه حمل و نقل, 15, 4, 1397, 207-221. فخری, منصور, شهنی‌ دزفولیان, رضا. (1397). 'تعیین عدد سازه‌ای موثر روسازی بر اساس شاخص ناهمواری و خرابی سطحی با استفاده از مدل‌های رگرسیون و شبکه عصبی', پژوهشنامه حمل و نقل, 15(4), pp. 207-221. فخری, منصور, شهنی‌ دزفولیان, رضا. تعیین عدد سازه‌ای موثر روسازی بر اساس شاخص ناهمواری و خرابی سطحی با استفاده از مدل‌های رگرسیون و شبکه عصبی. پژوهشنامه حمل و نقل, 1397; 15(4): 207-221. اطلاع از وضعیت سازه­ای روسازی می­تواند نقش موثری در پیاده­سازی و اجرای یک سیستم مدیریت روسازی کارآمد داشته باشد. تعیین عدد سازه­ای موثر می­تواند در طراحی، بهسازی و تعمیر و نگهداری، تعیین مقاطع همگن و پیش­بینی خرابی روسازی و شناسایی مقاطع نیازمند به آزمایش­های تکمیلی میدانی مد نظر قرار­گیرد. یکی از رایج ترین روش­های محاسبه عدد سازه­ای، استفاده از روش­های غیر مخرب با استفاده از دستگاه افت و خیز سنج لرزه­ای (FWD) می­باشد. لیکن هزینه انجام تست­های میدانی، نیاز به کنترل ترافیک و محدودیت در سرعت انجام کار، از مواردی مهمی است که استفاده از دستگاه FWD را در سطح پروژه و به ویژه در سطح شبکه با محدودیت مواجه ساخته است. 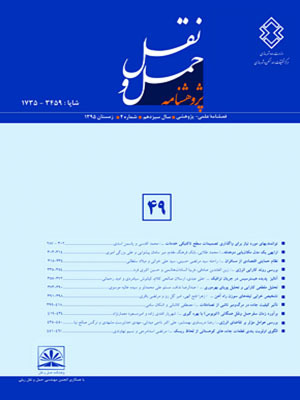 در این مقاله تلاش می­گردد در راستای توسعه روش­های موجود، با استفاده از روش­های سریع و نسبتاً اقتصادی، عدد سازه­ای موثر روسازی را با ترکیب شاخص ناهمواری و خرابی سطحی تعیین نمود. بدین منظور 52 کیلومتر از راه­های شریانی استان کرمانشاه و ایلام با مشخصات مختلفی چون ترافیک، عمر روسازی، ضخامت لایه های روسازی و انواع خرابی مورد بررسی قرار گرفت. همچنین، از دستگاه FWD جهت محاسبه افت و خیز در هر مقطع، از دستگاه­RSP جهت برداشت ناهمواری (IRI)و از دستگاه RD-3VV و بازدید چشمی جهت بررسی خرابی­های سطحی و تعیین شاخصارزیابی سطح روسازی (PASER)استفاده شد. به منظور برآورد عدد سازه­ای موثر، دو شاخص ناهمواری و PASER به عنوان متغیرهای ورودی در مدلسازی در نظر گرفته شدند. جهت مدلسازی از مدل­های رگرسیون توانی، خطی چند جمله­ای و شبکه عصبی با معماری مختلف استفاده گردید. نتایج حاصل از مدل پیشنهادی نشان می­دهد که می­توان عدد سازه­ای را با دقت بالا و خطای کم تعیین نمود. همچنین یافته­های این مقاله، بر برتری و توانایی نسبی استفاده از مدل­های شبکه عصبی در مقایسه با دیگر مدل­های رگرسیون دلالت دارد. Being aware of the pavement structural condition can play an effective role in implementing an effective pavement management system. An effective structural number can be considered for pavement design, maintenance and rehabilitation, detection of homogeneous sections, prediction of pavement deterioration, and identification of sections requiring additional field tests. One of the most common methods of calculating structural number is the use of non-destructive methods and equipment, such as Falling Weight Deflectometer (FWD). However, the cost of data collection, the need for traffic control and speed constraints are important things that have caused the use of the FWD to be limited at the project and especially the network level. In this paper, it is tried to determine the effective structural number by considering roughness and surface distress with fast and relatively economical methods. For this purpose, 52 km of arterial roads in Kermanshah and Ilam provinces were studied with different specifications such as traffic, age, pavement thickness and distresses. Also, for the determination of deflection, Roughness and PASER index (surface distress), assessment devices such as FWD, RSP, RD-3VV, and visual survey were used respectively. In order to determine the effective structural number, the roughness index (IRI) and PASER index, were considered as input variables in modeling. Also, power regression relation, polynomial linear and neural network models with different architectures were used. The results of the proposed model show that it is possible to determine the structural number with high accuracy and low error. In addition, the superiority and ability of neural network models to estimate the effective structural number, is significant compared to other regression models. -Robinson, R., Danielson U. and Snaith M. (1998), "Road Maintenance Management­", University of Brimingham and the Swedish National Road Administration. -Huang, Yang H. (2004), "Pavement Analysis and Design", 2th. Edition,University of Kentuvky: Pearson Education. -Kirbas, U. and Karasahin, M. (2016), "­Performance models for hot mix asphalt pavements in urban roads",Journal of Construction and Building Materials, pp. 281-288. -­Elbagalati, O., Elseifi, M., Gaspard, K. and Zhang, Z. (2016), "Development of the pavement structural health index based on falling weight deflectometer testing", the International Journal of Pavement Engineering. - Marcelino, P., Lurdes Antunes, A. and Fortunato, F. (2018), "Comprehensive performance indicators for road pavement condition assessment", Journal of Structure and Infrastructure Engineering. - Goel, A. and Das, A. (2008), "Nondestructive testing of asphalt pavements for structural condition evaluation: a state of the art", Journal of Nondestructive Testing and Evaluation, Vol. 23, No. 2, pp. 121–140. - Wu, Z., Zhang, Z. and Abadie, C. (2013), "Determining structural strength of existing asphalt layer using condition survey data", , International Journal of Pavement Engineerin, Vol. 14, No. 7, pp. 603–611. - Flora, W.F., PING, G. and Sinha, K,C. (2010), "Development of a Structural Index as an Integral Part of the Overall Pavement Quality in the INDOT PMS", Publication No: FHWA/IN/JTRP-2010/11, SPR-3062. - Macecos, V., Fontel, S., Lurdes, M. and Soll, M. (2017), "Evaluation of a highway pavement using non-destructive tests: Falling Weight Deflectometer and Ground Penetrating Radar", Journal of Construction and Building Materials. - Hyun Nam, B., An, J., Kim, M., Murphy, M.R. and Zhang, Z. (2015), "Improvements to the structural condition index (SCI) for pavement structural evaluation at network level", International Journal of Pavement Engineering. - Kavussi, A., Abbasghorbani, M., Moghadas Nejad, F. and Bamdad, A. (2017), "A new method to determine maintenance and repair activities at network-level pavement management using falling weight deflectometer", Journal of Civil Engineering and Management, PP. 338–346. - Nam, B.H., Murphy, M.R., Zhang, Z. and Arellano, M. (2013), "Improved Structural Condition Index for Pavement Evaluation at Network Level", Journal of Sustainable and Efficient Pavements © ASCE. - Gedafa, D.S., Hossain, M., Miller, R. and Van, T. (2013), "Network-level flexible pavement structural evaluation", International Journal of Pavement Engineering. - Chi, S., Murphy, M. and Zhang, Z. (2014), "Sustainable Road Management in Texas: Network-Level Flexible Pavement Structural Condition Analysis Using Data-Mining Techniques", Journal of Computing in Civil Engineering, © ASCE. -­Sollazzo, G., Fwa, T.F. and Bosurgi, G. (2017), "ANN model to correlate roughness and structural performance in asphalt pavements", Journal of Construction and Building Materials, pp. 684–693. - Al-Suleiman, T. and Shiyab, A.M.S. (2003), "Prediction of Pavement Remaining Service Life Using Roughness Data—Case Study in Dubai",The International Journal of Pavement Engineering, Vol. 4 (2), pp. 121–129. - Rada, G.R., Perera, R.W., Prabhakar, V.C. and Wiser, L.J. (2012), "Relating Ride Quality and Structural Adequacy for Pavement Rehabilitation and Management Decisions", TRB Annual Meeting. - Horak, E., Emery, S. and Maina, J. (2015), "Review of Falling Weight Deflectometer Deflection Benchmark Analysis on Roads and Airfields", 11th Conference on Asphalt Pavements for Southern Africa,16-19, Sun City, South Africa. - Horak, E. (2008), "Benchmarking the structural condition of flexible pavements with deflection bowl parameters", Journal of the South African Institution of Civil Engineering, Vol 50 No 2, pp. 2–9. - Schwartz, C.W., Li, R., Hwan Kim, S. and Ceylan, H. (2011) "Sensitivity Evaluation of MEPDG Performance Prediction", National Cooperative Highway Research program, Transportation Research Board of the National Academies, Project 1-47. -Kumali, Sangpetngam and Chalermpong. (2014) "Development of equations for determining layer elastic moduli using pavement deflection characteristics", TRB Annual Meeting. -Fuller, R. (1995) "Neural Fuzzy Systems", Abo Akademi University. -Hayki, S. (2009) "Neural Networks and Learning Machines", McMaster University, Pearson Prentice Hall. - Heravi, G. and Eslamdoost, E. (2015) "Applying Artificial Neural Networks for Measuring and Predicting Construction-Labor Productivity",Journal of Construction Engineering and Management, © ASCE. - Awodele, O. and Jegede, O. (2009) "Neural Networks and Its Application in Engineering",Proceedings of Informing Science & IT Education Conference (InSITE). - Plati, C., Georgiou, P. and Papavasiliou V. (2015) "Simulating Pavement Condition Using Artificial Neural Networks", Journal of Structure and Infrastructure Engineering. - Amin, S.R. and Amador, L.E. (2016) "Backpropagation Neural Network to Estimate Pavement Performance: Dealing with Measurement Errors", Journal of Road Material and Pavement Design. - Horak, E., Hefer, A., Emery, S. and Maina, J. (2015), "Flexible road pavement structural condition benchmark methodology incorporating structural condition indices derived from Falling Weight Deflectometer deflection bowls", Journal of Civil Engineering and Construction. - Schnoor, H. and Horak, E. (2012), "Possible Methods of Determining Structural Number for Flexible Pavements with the falling weight Deflectometer", 31th Southern African Transport Conference (SATC2012), Pretoria, South Africa. -Horak, E., Hefer, A. and Maina, J. (2015), "­Modified Structural Number Determined from Falling Weight Deflectometer Deflection Bowl Parameters and its Proposed Use in a Benchmark Methodology", Journal of Traffic and Transportation Engineering, David Publishing. -Highway Development and Management. (HDM-4). (2004), "Application Guide (Volume2); A Guide to Calibration and Adaption (Volume5) and Modelling Road Deterioration and works effects, Vol.6. - Hao Chen, D., Bilyeu, J., Hsiung Lin, H. and Murphy, M. (2000), "Temperature Correction on Falling Weight Deflectometer Measurement", Transportation Research Record 1716, Journal of the Transportation Research Board . -­American Association of State Highway and Transportation Officials. (AASHTO). (1995), "AASHTO Guide Design of Pavement Structures", Washington D.C. USA. -Fernandi, E.G., Liu, W.and Ryu, D. (2001), "Development of a Procedure for Temperature Correction of Back- calculated AC Modulus", Texas Transportation Institute, FHWA/TX-02/1863-1. -­Walker, D., Entine, L. and Kummer, S. (2002), "Pavement Surface Evaluation and Rating", Asphalt PASER Manual, University of Wisconsin-Madison. -Pavement Management Guide. (2012), American Association of State Highway and Transportation officials. (AASHTO), 2 th Edition. -­Chou, Y.J. (1993), "Knowledge-Based System for Flexible Pavement Structural Evaluation", Journal of Transportation Engineering, ASCE. -Peterson, G. and Shepard, L. W. (1972), "Deflection analysis of flexible pavements", Materials and Test Division Report, Utah State Dept. of Transportation.